Maurizio Sarri revealed he had “dealt with” Marco Ianni after his second assistant coach incited a touchline bust-up during a dramatic finish to Chelsea’s 2-2 draw with Manchester United. ‘Sincerely I have not seen what happened, but then I spoke to Jose, of course, then I spoke to the member of the staff because I think that we were on the wrong side, so I have dealt with this immediately,’ Sarri told Sky Sports. ‘I think it’s private. I spoke with the member of staff and I have to be very hard. I cannot come here and tell everything, otherwise with my staff I am not credible. The Blues fought back to preserve Sarri’s unbeaten Premier League record, substitute Barkley securing a point when he fired home in the sixth and final minute of additional time. Antonio Rudiger had headed the hosts in front, but United turned the game around, Anthony Martial grabbing a brace in an absorbing contest between Mourinho’s current club and one of his former employers. 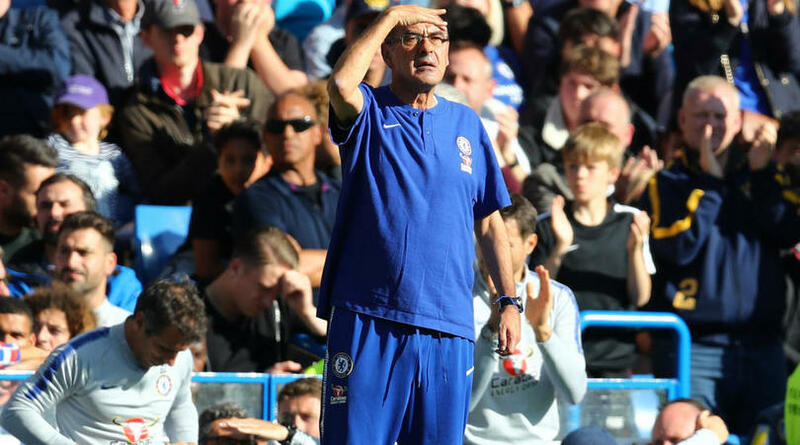 Sarri was disappointed with how his team struggled to cope with the visitors’ more direct approach in the second half, though he will watch the game back before making a more detailed assessment of Chelsea’s performance. ‘I want to play for three points. For 60 minutes we played our football,’ the former Napoli coach said in his post-match press conference. ‘Then after 1-1, we didn’t play our football, only the long ball, we are not organised for the second ball. In this type of football, United are better than us. I am really disappointed in this type of performance. ‘The 2-2 in the last minute is okay, okay for the confidence of my players, but I have to look [at] something.